apanese waiters, and Karate practioners, shout as they go about their business. They shout "Welcome" to the customers, and sometimes even shout out the customers orders such as "An extra helping of Ramen!" in voice loud enough for the clientee and staff in the whole restaurant to hear. There are a number of reasons why they are doing this, including the fact that such shouting is approved of by the majority of Japanese customers. Additionally it may the the case that shouting makes them better at their job. 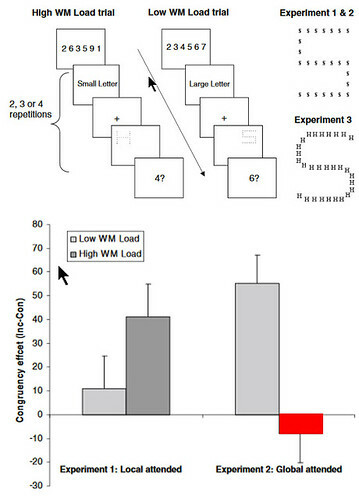 Lubna Ahmed and a colleague (Ahmed & W de Fockert, 2012) gave subjects one of two low difficulty and high difficulty memory tasks, before asking them to respond with either the small or large letter represented by a Navon figure. In the low load condition, the numbers that the subjects remembered where consecutive ascending, whereas in the high load condition the numbers were random. I suggest that the random, but not consecutive number condition, the subjects usually resorted to the typical phone-number memory method of repeating the digits. Under t his condition they became faster at recognising the large letter represented by a Navon figure: "S" in the case of the figure above right. This is because repeating the digits loaded and turned off the linguistic analytical mind, leaving them to react naturally and more quickly to the globally presented "S." Waiter's likewise, whose job it is to attend to the needs of a restaurant full of customers, and Karate practitioners who need to react with speed to movements of an opponent, can benefit from loading their linguistic brain, allowing to respond rapidly, naturally and in a Western sense mindlessly.